Click to deliver this Sweetest Affair Hamper that delivers happiness instantly when unwrapped. 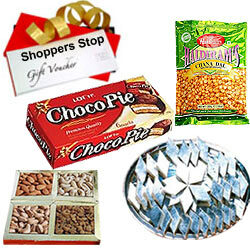 This Hamper is accompanied with 100gms Assorted Dry Fruits, 250gms Haldiram Kaju Katli, 200gms Haldiram Chana Dal, Chocopie and Rs. 500 Shoppers Stop Gift Vouchers.